It was an extremely tight vote for first place, but Nebraska’s senior setter Kelly Hunter came out on top of the vote to collect the 2017 VolleyMob Women’s National Player of the Year honor. 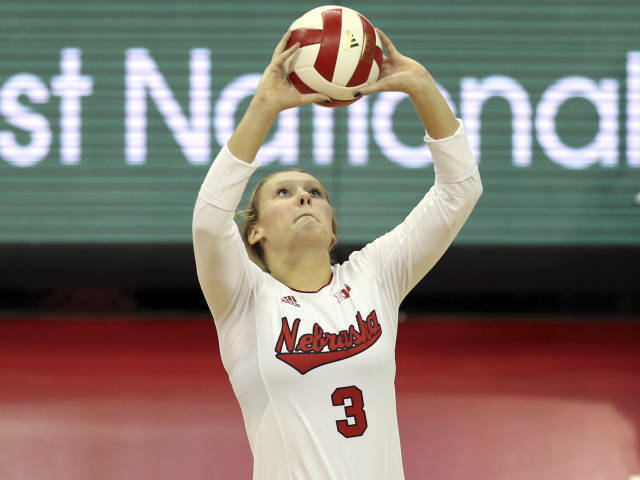 Hunter is coming off of a season in which she led Nebraska to a National Championship – its fifth in program history and second in three seasons. That occurred despite some big losses to the Huskers roster in the offseason, as Hunter represented the toughness and overall team-game of Nebraska in 2017. It’s a bit ironic that her team-centric game earned the biggest individual award we could supply, but her overall play and leadership made her a great choice. In total for the season, Hunter notched 10.72 assists per set, 2.73 digs per set, 0.79 kills per set, 0.55 blocks per set and 0.23 aces per set. She also won the Big Ten Setter of the Year award. Hunter even had to battle an early-season injury, which showed how dire she was to her team’s success. Without her in the lineup, Nebraska went 0-2 and hit .164. One of those losses came to Florida too, who Nebraska would convincingly defeat in the National Championship with Hunter in the lineup. She re-appeared following that second match, but played in a 6-2, which hurt her overall statistics for three matches. Still, her presence was felt, as it would be for the rest of the year when the team went 32-2 and hit .292 in matches she appeared in. The choice wasn’t an easy one, as plenty of others were deserving candidates as well. In fact, Stanford’s Kathryn Plummer, who won the AVCA National Player of the Year honor, earned as many first-place votes and was just one point behind Hunter overall. Haleigh Washington also grabbed a pair of first-place votes but didn’t have the depth of votes as others, which led to her teammate, Simone Lee, ranking higher despite no first-place nods. In total, 14 players earned some sort of recognition too, demonstrating how many great performances and individual stars there were this season in the volleyball landscape. The vote was made by eight staff members from VolleyMob, who each listed their top five candidates before the total was aggregated together for the overall results. The entire VolleyMob staff vote on the 2017 Player of the Year can be seen below.